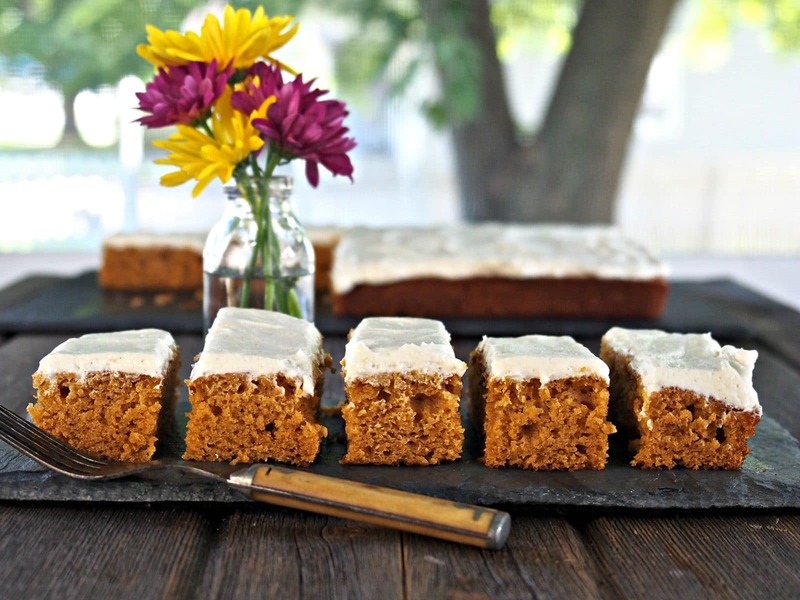 If there is one dessert that makes its presence throughout autumn, it is Pumpkin Bars. 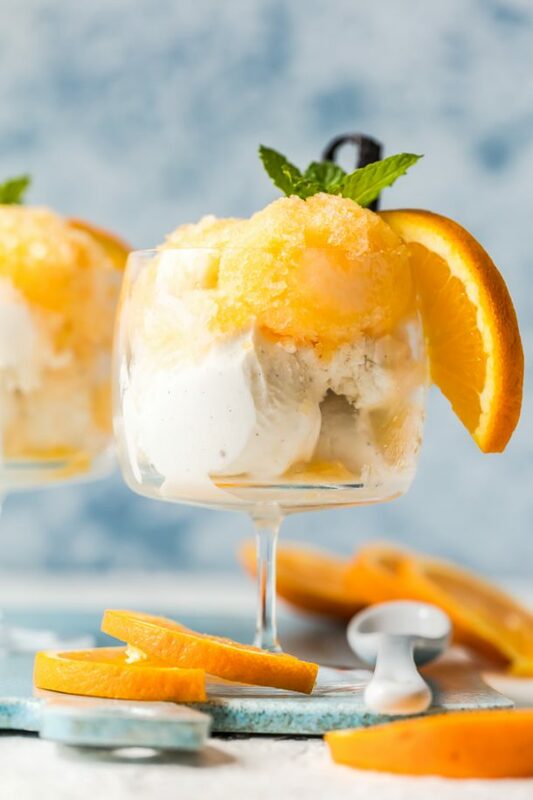 I know I’ve said this about other desserts, but this is one of my all-time favorites. No, I’m not stretching the truth each and every time I make that statement; I just have a ton of favorite foods. 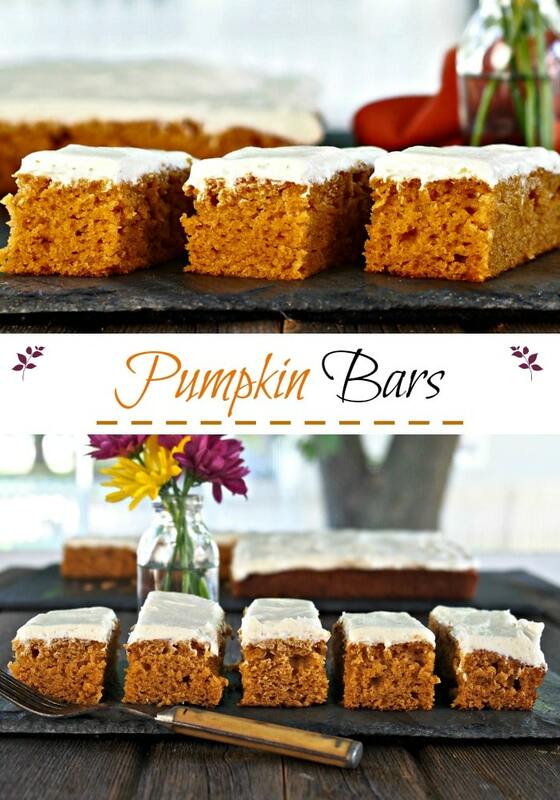 As far as Pumpkin Bars are concerned, it seems I’m not the only one in love with them. 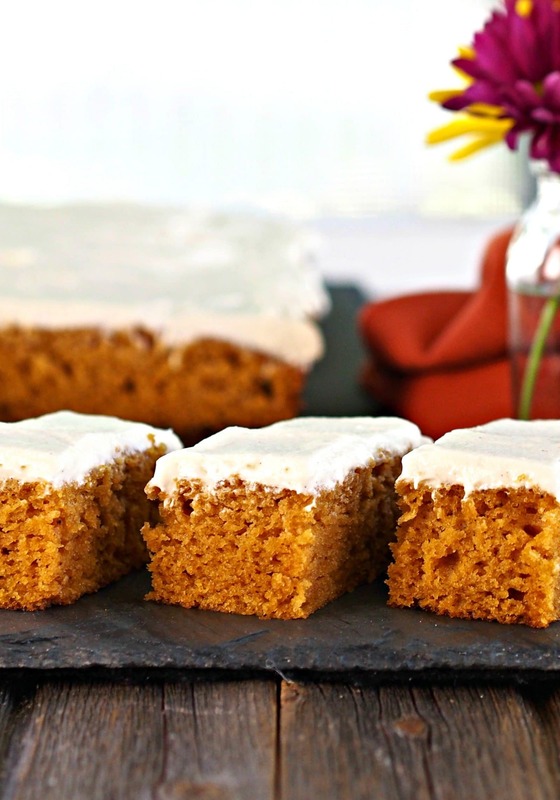 Pumpkin Bars can be found at most gatherings during these holiday months, and I can be found, with my plate piled high, in a corner, shoveling bite-after-bite into my mouth. 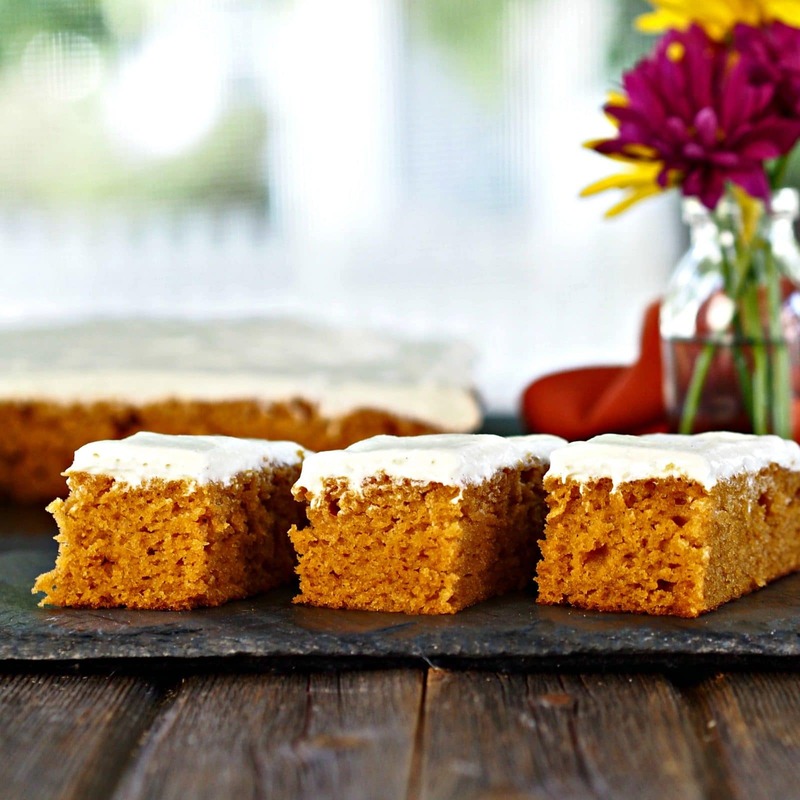 This luscious, pumpkin-flavored sheet cake is infused with cinnamon, ginger and cloves. Of course, the fun doesn’t stop there. It is then slathered with the greatest (and I do mean greatest) cream cheese frosting, and if you want to have even more fun, sprinkle the top with honey-roasted pecans. Just so you know, this cake is just as fabulous with or without added nuts. 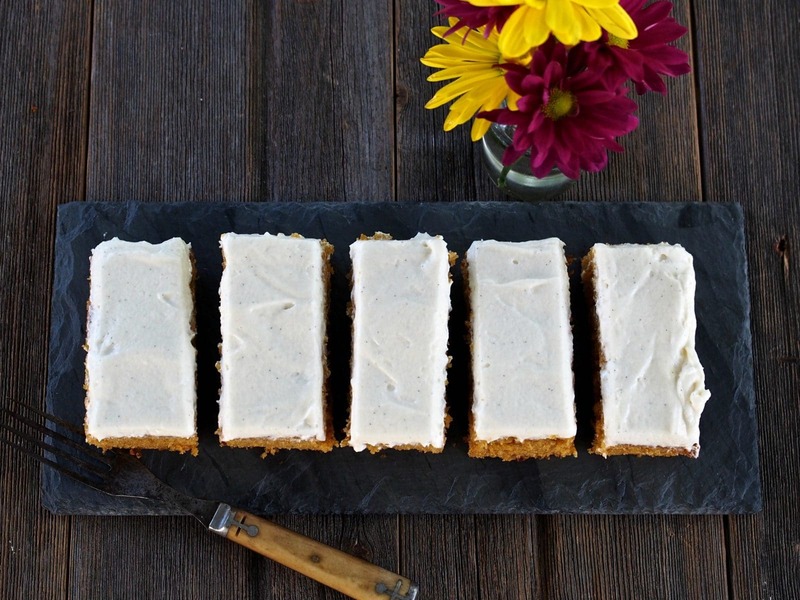 Pumpkin Bars, oh Pumpkin Bars, come to grand-mama! I make this guarantee because I want your trust. From now on, anytime I say a food is one of my favorites it is because that particular recipe truly is one of my favorites. You see, I’ve lived a long time so I have a ton of recipes I love, and the list seems to grow weekly. 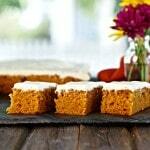 Pumpkin Bars. 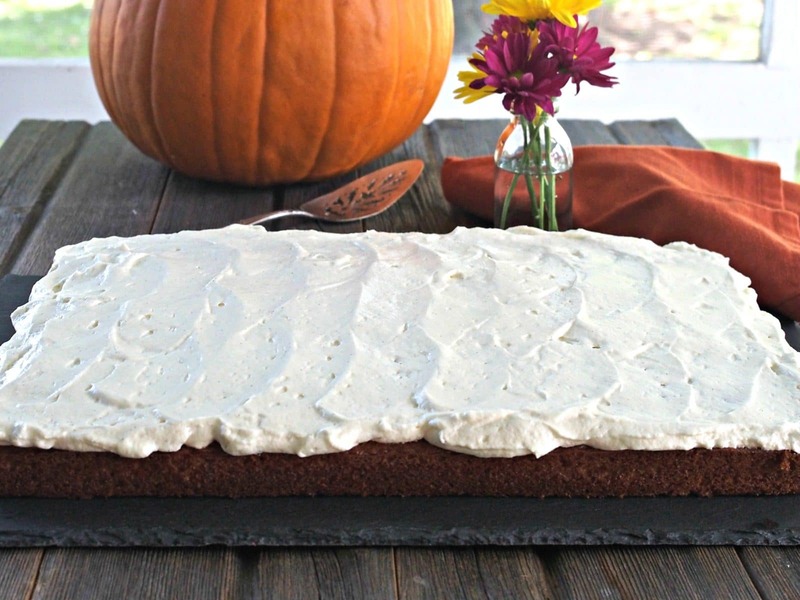 Pumpkin sheet cake made with pumpkin puree & fall spices then topped w/creamy, tangy, perfect cream cheese frosting. The ideal fall dessert. Spray a 15x1x10 inch sheet cake pan with baking spray. Combine dry ingredients in the mixing bowl of a stand-mixer. Add all wet ingredients and mix on MED 2 minutes. Pour into the prepared pan and bake at 350F, 22-25 minutes or until a toothpick inserted in the center comes out clean. Transfer cake to a cooling rack to cool completely. Ice with Best-in-Your-Life-Ever!! Cream Cheese Frosting. Place cream cheese, butter, sour cream and vanilla in the mixing bowl of a stand-mixer. Using a whisk attachment at MED-HIGH speed, mix until well combined and creamy. Scrape the icing down the bowl as needed. Turn mixer off and add powdered sugar. Whisk on low 15 seconds then on MED-HIGH 2 minutes until smooth, creamy and fluffy. I tried these for a family dinner party. Everyone loved them! I am not usually a fan of pumpkin flavor, but these were great! Light and moist, and the cram cheese frosting was super! Hello Meg, Thank you for your question. I'm sorry I'm having some issues with my recipe card and some of my recipes are quirky. Yes, it should read 1 1/4 cups powdered sugar. Thank you and I hope it works out well. Hello again, Meg. I have not made cupcakes with this recipe. If you do and they turn out well, please let me know. Thanks again.